Engineered for enjoyment, the 2018 Honda Clarity Plug-in Hybrid is now available at Townsend Honda. With the combination of an electric motor and an In-line 4-cylinder VTEC® engine, the Clarity Plug-in Hybrid is able to utilize both electric and gasoline power as it drives. And its 17-kWh Lithium-Ion battery has a very convenient full charging time, with around 2.5-hours for 240-volts and 12-hours for 120-volt; though the charging time varies depending on conditions, such as the remaining battery level and the ambient temperature. You can see in the chart the impressive EPA mileage ratings that the 2018 Clarity Plug-in Hybrid has received as well. But that's not all, this environmentally-friendly car is also designed to provide passengers with ample space and comfortable seating. In fact, five adults can comfortably sit within the 101.5 cubic feet of passenger space. If you are going for a trip, don't worry about packing too much, the Clarity features an impressive 15.5 cubic feet of cargo space. *Based on 2018 EPA range rating. Use for comparison purposes only. Your range will vary based on how you drive and maintain your vehicle, driving conditions, powertrain condition, and other factors. The new Clarity Plug-in Hybrid has many amazing features available that offer more convenience than before. Such as the standard push button start, automatic-dimming rearview mirror, dual-zone automatic climate control system and heated front seats. Plus, the intuitive Honda Sensing® suite of driver-assistive technologies is standard on each car. Plus, many more innovative features! 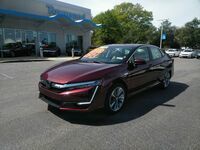 If you are interested in the 2018 Honda Clarity Plug-in Hybrid, you can contact us at Townsend Honda for more information. Interested in a 2018 Honda Clarity?